Everyone is probably aware of the popular portrayal of the Italian occupation of Albania. After annexing the Sudetenland, in March of 1939 Nazi Germany marched into the remainder of Czechoslovakia, making Bohemia and Moravia German protectorates and allowing the establishment of an independent Slovakia, closely tied to Germany. Upset at being given no advance warning, and not wishing to be left behind in the gobbling up of small countries, a month later Benito Mussolini ordered Italian forces to occupy Albania. That is the usual story and it is usually told in the context of a long list of German and Italian acts of aggression that finally forced Britain and France to draw a line and eventually go to war over the German invasion of Poland. However, the untold truth is that the situation was not so clear-cut and, as was all too common with the Balkan monarchies of World War II, at least one of the future Allied nations was not, originally, sympathetic to the supposed plight of the Albanians. Everyone well remembered how the last world war had started over a problem in the Balkans and not a few were concerned that the second could start there as well. However, neither Hitler nor Mussolini were the ones most, at the time, were worried about starting it. Ahmed Zog was the unknown quantity in Balkan affairs. 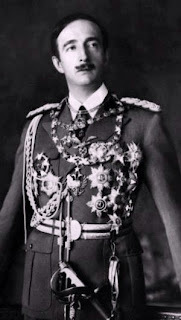 He had first seized power by force in Albania in 1922 but was chased out only to return in 1924 with backing from the neighboring Kingdom of Yugoslavia. He was made president with dictatorial powers but when he refused to give Yugoslavia the special favors they expected for supporting him, the Yugoslav government felt betrayed and relations between the two countries became tense. Having lost their backing, Zog turned to the Kingdom of Italy across the Adriatic which, during World War I, had been given a secret agreement by the Allies recognizing Albania as an Italian protectorate in all but name. In 1928 President Zog elevated himself to “King of the Albanians” and while Italian investment poured into the country, others in the region and around Europe looked on with concern. As in Serbia, and Romania and Bulgaria there was a drive in Albania to expand to a “Greater Albania” and by declaring himself the king of a people rather than a country, many worried that Zog had his eye on territories of neighboring countries populated by ethnic Albanians (Kosovo, then as now, being the #1 ‘hot spot’). This would certainly have played well for the new King among the ranks of the Albanian nationalists and Zog certainly needed support. Almost everyone in and outside of Albania seemed to have some reason or reasons to be frustrated with Zog. The local chieftains, from whose ranks he had risen, were always squabbling. Zog established a secular state, taking the new Republic of Turkey as his example, and so offended Muslim hardliners. Islamic clerics were also offended by his lifestyle, his love of gambling and his marriage to a Catholic Hungarian-American. This also disappointed Mussolini who hoped that he might marry an Italian princess and so draw Albania closer into the orbit of Rome. Muslim opposition was the most serious (when and where it occurred) in the overwhelmingly Islamic country but, as Zog tried to pull away from Italy he also angered the religious minorities such as when he nationalized all of the Catholic schools in Albania on the grounds that many were operated by Italians. Hitler had been friendly enough at first but the Nazi dictator was certainly not best pleased when Zog made Albania a haven for Jewish refugees. At the same time, there were fundamentalist Muslims who were just as upset at their Muslim king welcoming Jews into the country. Today Zog may be best known as the world’s heaviest smoker but it would not be surprising if he also held the record for having more people trying to kill him than any other world leader. There were reportedly hundreds of plots against him and he survived 55 assassination attempts. Obviously, this forced him to stay out of sight as much as possible and while any other Albanian leader may have been treated the same, it certainly did little to reassure the international community about the stability of his regime. There were lingering tensions with Yugoslavia and considerable animosity with Greece, due to religious differences, historical grievances and suspicion about territorial claims based on Albanian populations in these countries. Things would become so bad that Greece finally had the Albanian population in the northern Epirus region put it concentration camps. What worried leaders in the west was that King Zog might do something in an effort to solve his problems that would end up starting a war. Zog biographer Jason Hunter Tomes wrote, “unable and frankly unwilling to have much faith in any group of his people, Zog strove to keep all classes in unstable equilibrium. Through hours of hideously convoluted talk, he obsessively manipulated his assorted underlings (nearly all older than himself) in an effort to exercise personal control from seclusion”. Oddly enough, Mussolini was probably the one world leader least concerned by all of this. What sort of ruler Zog was or how popular he was mattered not at all to him and if tensions existed between Albania and Greece and Yugoslavia, there was little love lost between either of these countries and the Kingdom of Italy under the Fascist regime. Yet, what did matter to him was that Italy was getting no return on its investment and Zog was taking further steps to distance his country from Italy. To his Albanian supporters this was the King standing up for independence and national sovereignty against creeping Italian influence. In Italy Zog was seen as having gained all he could from them only to then cast them aside to search for a new benefactor as he had previously done to Yugoslavia. Italian advisors were dismissed from the Albanian army, the previous agreements with Italy were repudiated and Zog sought (unsuccessfully) closer ties with other countries. For Rome, the last straw came when the Albanian parliament announced a moratorium on debt payments to Italy. For Mussolini, this was the pretext on which to take action. It had nothing to do with events in Czechoslovakia but everything to do with the Italian economy and the desire to secure resources which Albania had but Italy lacked. This all came in the aftermath of the Italian conquest of Ethiopia over which the League of Nations had imposed sanctions on Italy and the very costly Italian intervention on behalf of Franco in the Spanish Civil War (though not always remembered, Italy gave vastly more assistance to Franco than anyone else). The Italian economy was stretched thin and badly needed Albania to make good on its debts. Furthermore, the sanctions (which particularly infuriated Mussolini) highlighted to the Fascist leadership their need for secure sources of raw materials that foreign powers could not deprive them of to punish or coerce Italian foreign policy. In quick order an ultimatum was sent to Zog, demanding that, if he wished to retain his throne, he agree to basically make Albania an Italian protectorate in both fact and name. 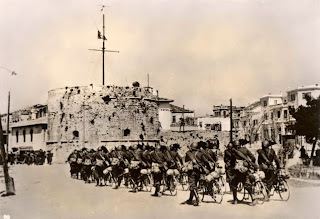 Zog, of course, refused and on April 7, 1939 Italian troops began landing on the Albanian coast. It was not exactly an “invasion” as there was practically no resistance. 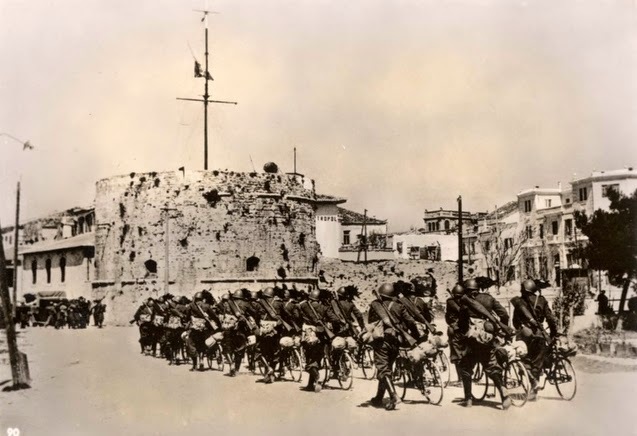 Most of the officers of the Albanian army had fled the country, the New York Times reported that the local population cheered the Italian troops and by the time they came ashore King Zog and his family retinue were already fleeing the country. As for the other monarch involved, King Victor Emmanuel III of Italy had thought the occupation of Albania too risky, in keeping with his conservative, cautious nature. It was sure to upset the French (which it did) but when an Albanian delegation came to Rome to offer him the crown as King of Albania, he graciously accepted. King Zog fled to Greece but could not stay long and soon made his way to France where he was more warmly received. The French were concerned that, with their eastern coast secured by the seizure of Albania, Italy would be a threat to them in the west. The distant United States was sympathetic and Zog’s radio messages to his people were played all over the country so that many more Americans heard his word than Albanians, the vast majority of whom owned no radios. However, what many will find the most surprising among the untold truths of the Albanian situation is the reaction of the British. In public and in the media there was, of course, plenty of sympathy for Albania and condemnations of the actions of Italy. However, for those in the halls of power, who had long worried about Albania and the ‘Balkan powder keg’ the private reaction was quite different. British intelligence agents reported on the swift and efficient Italian occupation and pacification of Albania as providing a stabilizing presence in an unstable region. Once it was done, Sir Anthony Eden, British Foreign Minister and, it should be remembered, a man with a bitter, personal grudge against Mussolini, sent the Duce a personal telegram thanking him for his decisive action and assuring him of British support. This was not widely known at the time, nor are most aware of it today as the outbreak of World War II years later put it at odds with the official narrative of British opposition to a succession of acts by the Axis powers which have since been put forward to justify the Franco-British declaration of war against Germany. So, it was grouped together with the Japanese occupation of Manchuria, the conquest of Ethiopia, the China incident, the annexation of Austria, the occupation of Czechoslovakia and then, after the occupation of Albania by Italy, the German invasion of Poland. However, the British government was far from being critical at the time and viewed the Italian occupation of Albania as something that benefited the region. Britain may also have been reacting to a recent change in opinion regarding the Nazi regime in Germany. Strange as it may seem today, in light of subsequent events, at one time the British seemed more willing to accommodate Hitler and regarded Mussolini as the greater threat. However, when Hitler started grabbing territory in Eastern Europe, there was a sudden about-face in British policy. The year before the occupation of Albania, Britain had recognized the legitimacy of Italian East Africa and King Victor Emmanuel III as Emperor of Ethiopia. 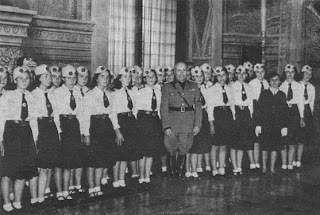 The reaction to events in Albania may have been influenced, at least in part, by an effort to woo Mussolini back into a friendlier relationship and to restore his previously hostile attitude toward Hitler. If so, it was too little, too late. The sanctions had infuriated the Duce beyond measure and, as he told a crowd on a visit to Germany, the fact that Germany had not joined in such sanctions was something he would never forget. As for King Zog, he was never to relent in his claim to power in Albania and his efforts to restore his regime. Forced out of France by the advance of the German military, he and his family relocated to Britain and while his family moved to safer environs near Windsor, Zog himself remained in London. There, in the Allied nerve-center, Zog was constantly pressuring Churchill to send him to the front in some capacity to take part in the war against the Italian and later German forces occupying Albania. However, for Churchill and his government, a cold pragmatism ruled the day that sidelined all other considerations besides the quick and complete defeat of the Axis powers. Britain had greater interest in Greece but in Albania, as in other areas, the only concern was who had the most anti-Axis forces to help ensure victory and in Albania, as in those other areas, that force was the communists. Neither Britain nor America was prepared to throw their full support behind a restoration of Ahmed Zog and so almost all Allied support ended up going to the communist partisans which included the future fanatical tyrant of Albania Enver Hoxha. Of course, Zog had his supporters in Albania but with some Albanians supporting Zog, others supporting Italy, others later supporting Germany, the divisions of the anti-communist forces left the pro-communist side with the most potent force on the ground and that was all that ultimately mattered to the high command in London. Things were set to get much worse for Albania in the aftermath of World War II. However, to end on a more positive note, there was some royal reconciliation after it was all over. 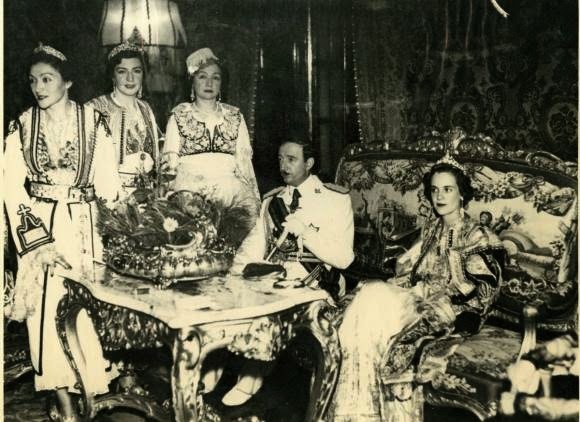 The Albanian Royal Family left England in 1946 and was given a warm welcome in Egypt by King Farouk. 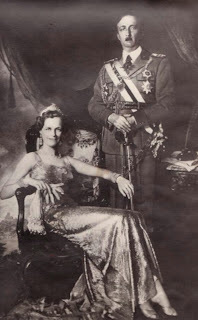 As it happened, they shared their Egyptian exile with King Victor Emmanuel III of Italy (who had renounced his title as King of Albania), his daughter Queen Ioanna (Giovanna) and grandson King Simeon II of Bulgaria. Queen Ioanna and Zog’s wife Queen Geraldine became close friends and the two women brought about an official reconciliation of the two families which has endured to this day. In 2012 Prince Victor Emmanuel of Naples (along with his son the Prince of Venice) invested Prince Leka II of Albania with the Grand Cross of the Order of Sts Maurice and Lazarus. The royals patched things up but it has been harder putting right all that had gone wrong in Albania itself in the years leading up to and during World War II when Albania, like most of the Balkan monarchies, came away with reasons to be bitter against both the Axis and the Allies. 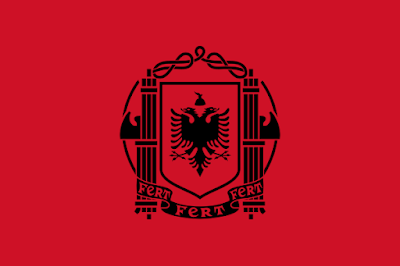 Additional Note: I cannot help but think that if a more Metternich-like policy had been pursued by the Allies, Albania would be a kingdom today and naturally much better off. Such a policy would have seen Italy allowed to retain its past gains to come alongside with the Allied nations (as was done with many Napoleonic states) or that Zog would have at least been given a battalion, even if it had to be filled with mercenaries, to go home and fight for his country as he stated so often that he wished to. It might not have made the difference but, you never know, might have turned out do quite well. Of course, Metternich never had to deal with the necessity of allying with a regime like the USSR. Alas, Albania would not be the only Balkan country to feel victimized by both sides in the war. What really started the Second World War was Hitler throwing the moneylenders out of their flesh palaces and temples of Mammon. Italy clamped down on the mafia who were heavily involved with The International Drug Trade run by Baron Rothschild and the British Empire. Poland was never an ally of Britain. Churchill said nothing when FDR handed Poland completely to Josef Stalin at the Alta Conference. Its all a Big Lie. If all of that were true it would have started much sooner. No one cared what Hitler did inside Germany (all the anti-Jewish laws) until he started messing with the neighbors. Britain's role in the drug trade ended long before any of that but I know better than to try to argue with someone who believes in "magical Jews". It is true that Mussolini cracked down on the Mafia and it is true that many Mafia gangsters were on the US govt payroll. No one even denies that. Britain gave Poland a war guarantee but it was a promise Britain couldn't possibly keep, and, for the record, Churchill was just as much involved in the decision to hand Eastern Europe over to Stalin as FDR was, though even if they had not been, there was nothing they could have done to stop him from taking over. As usually happens, what your army holds at the end of the war is what you end up keeping. Churchill and the Allies did tend to disappoint in such simple matters as the preservation and restoration of monarchies. But to get to the point, your mention of Metternich makes me wonder what your overall opinion of his policies is. I have a generally favorable view of Metternich. You can see the post on Francis I for that since what Metternich did was in line with what Francis wanted done. I think the extent of his reactionary "purity" has been exaggerated, he was a pragmatic man in his policies but, I don' think anyone can argue, his monarchial legitimism tempered by pragmatism worked very well. Where is the Monarchy World Power?